Christmas and New Year was a great break for us, with two weeks of freedom from the daily grind. It's something I was really looking forward to after the last three months, which have been pretty hectic. We spend the days either side of Christmas at my parents' house, with a brief visit to the Wirral to see some friends (Nathan's godfather) and Jill's parents. It was very relaxing, except for the fact that Nathan started to teeth on some of his back teeth and he really let us know it. It was pretty tiring, but at least it wasn't when we were at work. Fortunately, being at my parents meant that we could pass him on and catch some sleep after we'd been up a lot of the night. On a plus note, I used the late night play sessions to catch up on a number of films on DVD which I hadn't thought I'd get to. Oops! Did I do that? 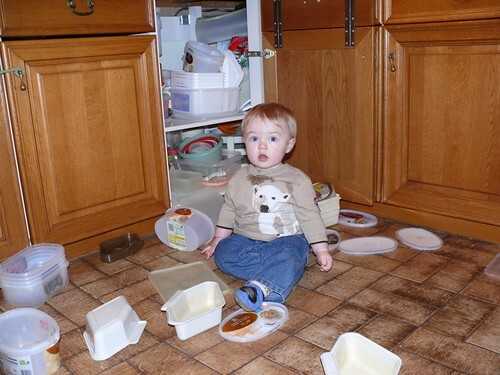 Nathan discovers his Gran's tuperware cupboard! Not unsurprisingly, Nathan was as excited with the wrapping paper as he was with his presents. He was a very lucky boy, and I was very glad I had the roofbox on the Avensis when we headed home or we wouldn't have fitted everything in. Amazing how much 'stuff' a small boy has. He had a number of presents he was very taken with, and the simple wooden ones certainly competed strongly with the electronic, noisy ones. I'm sure this will change with time. Before we left my parents, we had a great little early party for Nathan's birthday on the 9th January as all his cousins were there. Although Sam is in Afghanistan, Alix had brought the kids over from Germany to the UK at Christmas. Pretty brave, doing this on her own, but she does approach it like a military operation which is probably the only way you can do this with 4 kids and remain sane. It was fantastic seeing them all. They travelled over from Germany on the Chunnel on Christmas Day, having done presents etc. inthe German tradition on Christmas Eve. The kids had a special surprise as Sam managed to be back in the UK for 24 hours and turned up to see them unannounced. A brilliant Christmas present for them! As well as Alix, Jill's parents and sister came as well and brought a lovely cake which Nathan was very taken with because of the chocolate buttons it had on it. He's very taken with chocolate buttons and grabbed a handful! New Year was grim as Nathan announced he had the vomiting virus by being sick over my bedside cabinet and Jill and I both subsequently came down with it. Although it wiped the pair of us out like 'flu, Nathan seemed to weather it far better than we did and recovered far more quickly. It appears to have gone through the family as my dad has had it since, as have some of Alix's kids. My Dad having it was a bit touch and go, as Jill had some business with the IMechE related to our Region, and went down for a meeting in the started of the New Year. My mum and dad had offered to babysit for us, so we had a long weekend in London for our wedding anniversary. We were getting pretty nervous that my mum and dad wouldn't make it with the virus, but it all ended happily. It was great to get some time together, marred only by the fact that we were so tired after being ill! We stayed at the ever faithful County Hall Premier Inn (where we had the experience of a fire alarm one night) and did some touristy things. We also had a lovely meal for our anniversary at the Italian restaurant – Locale – opposite the County Hall. This showed that we'd become alcohol light-weights as we failed to finish a bottle of nice wine that night! A highlight of the trip was the visit to The First Emperor at the British Museum. We couldn't pre-book tickets (they've sold out until April when it closes!) so we found ourselves standing in a queue at 9.05 am on the Saturday to hopefully get some of the 500 tickets that they release each day. The queue started to move at 9.15, and by 9.25 when we got to the front the earliest tickets we could get were for 17.10! We took these and the wait was definitely worthwhile. We had a quick look around another gallery, then headed back to go somewhere else. I was also pretty chuffed that I found a games shop immediately opposite the museum, and managed to find some things that I'd been after for a while! Somewhere Else was the Cabinet War Rooms and Churchill Museum (rather than the last Marillion album!) which was absolutely superb. It really gave a feeling of what the place must have been like in the Blitz and beyond, and I learned far more than I ever expected about Churchill. We happily spent three hours there and I'd recommend it. I found it particularly relevant as I'm involved in playtesting a new game set in the 1960s assuming the Cuban Missile Crisis had gone nuclear; looking at the kind of facility used to run the government was very helpful to get the feel in my head for this. Anyway, The First Emperor was absolutely excellent. It had less in it than the Persian exhibition we'd seen some years before at the British Museum, but less was definitely more. There was a far stronger narrative here, and less of a feeling that you were looking at a massive collection of bling from ancient times. I'd read a little on Qin, the state that the first Emperor had expanded and used to create the first iteration of China from, ironically in an RPG, and that taster made the exhibition even more worthwhile. I'd love to see it again if I got the chance, but I suspect that won't happen. The follow on exhibition on the Roman Emperor Hadrian looks pretty interesting too, but somehow I can't imagine it being as popular. So, the Christmas and New Year Break was a good one for us, and we went back to work feeling refreshed. If we didn't catch you at the time, then we'd like to wish you all a happy and prosperous New Year. Note: I'd hoped to have some pictures here with this, but I may well add them later when I get the connection back up properly as I can't upload anything substantial.